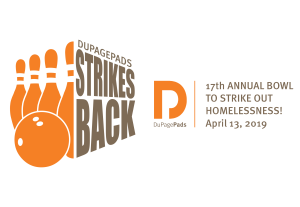 Your opportunity to strike out homelessness returns for the 17th annual DuPagePads Strikes Back, held Saturday, April 13, 2019 at Fox Bowl in Wheaton from 12:00pm – 3:00pm. 30 teams will compete to strike out homelessness with trophies awarded for top team bowling score and top fundraising. DuPagePads Strikes Back is a great team-building activity for your company, perfect for spending time with your family and a fun day to get social and do some good with friends. As you arrive enjoy complimentary t-shirts, pizza, soda and ice cream. Additionally, many great raffle prizes and auction items are ready for you to win. Your team fundraising webpage is provided for each 5-person fundraising team, making it easy for you to collect donations and share with your friends and family. Every team has a goal of $500 funds raised to support DuPagePads’ programs providing housing, coupled with support services and employment solutions to assist families and individuals who are homeless in DuPage County. Do not miss out on the fun and philanthropy and add your team to compete with groups like the West Suburban Alumni Chapter of Phi Alpha Delta Law Fraternity, International who has been participating in DuPagePads bowl for over 9 years and brings multiple teams every year. “Our group’s mission is service to the community and helping DuPagePads is a great way for our members to give back,” says B.J. Maley, Attorney and Phi Alpha Delta member. Now is the time to register your team before all lanes fill up. To register and get more information, visit www.dupagepads.org/events or contact Carrie at 630.682.3846 ext. 2290 or CFlick@dupagepads.org.